With a baby on the way, one of the key pieces of protective gear will be a baby stroller. Carrying a child is impractical, so a stroller is a way to go if you need to travel with your baby. Truthfully, there is no definitive best stroller for all babies. Depending on the age of the child and the environment of usage, you can find several types of baby strollers. Newborns (age up to 6 months) require extra care due to their lack of neck and head control. It would be prudent to consider buying a stroller with a full reclination support. 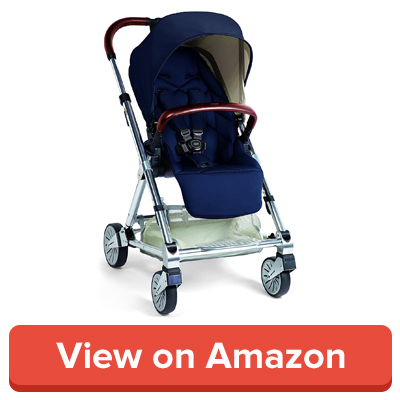 While these can’t be moved around as easily, they are padded and safe, suitable for short gentle strolls. If you tag your baby (age 6 months – 3 years) along with you to errands, parks, and playdates, you’ll need a light stroller for ease of travel. These strollers are bulkier than all the other types and cost more as well. They are for parents with two infants. The age difference between them matters if you want to choose a stroller. Infants with 2-4 years’ gap tend to do better in side-by-side strollers. Occupying one car seat, it is best suited for two children of nearly the same age. There is sufficient room for two children weighing less than 50lbs each, although 4-year olds and larger 3-year olds have trouble fitting in. Each seat has a padded, 5-point harness. 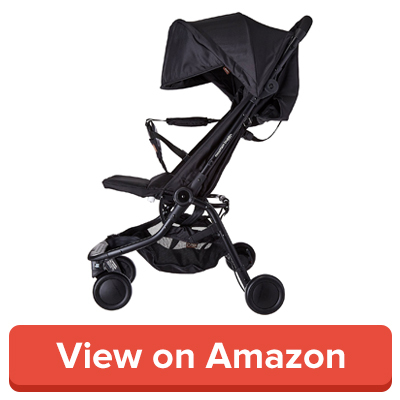 It barely reclines, has an adjustable leg rest and the front seat is barred from keeping the baby from falling out. The rear seat reclines almost completely, capable of accommodating an infant. The Hop is equipped with a canopy against rain and a cup holder, and two peekaboo windows to check in on the babies. It also has high handlebars, but taller children might reach the back of the stroller. The nether portion has a medium-sized basket that is only accessible through the sides, and typical of umbrella strollers, a large diaper bag can’t fit in. With 6-inch wheels and rear wheel suspension, it can traverse relatively rough terrain (for an umbrella stroller that is). The brakes are one-step and you can fold the stroller in your flip-flops. 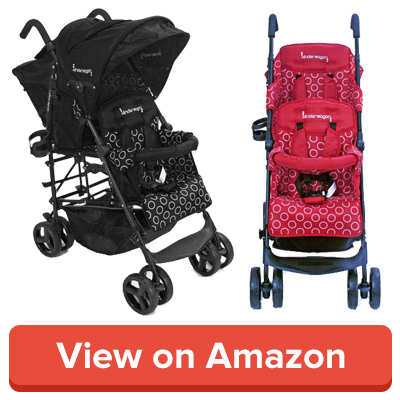 Double umbrella strollers are light, yet sturdy and easily transport in and out of cars. They have little wheels that fold well, but the storage is limited with only a few bells and whistles. They are the ideal airline and car travel strollers. 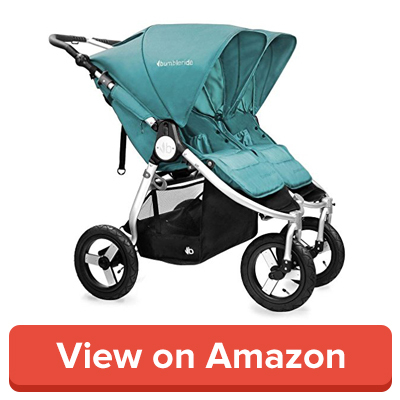 The Bumbleride is one of the most fashionable strollers in existence. Where most strollers are available in blacks, reds, or browns, this one has six different color palettes. The stroller is 30 inches wide, passable through most doorframes, and weighs a total of 90 lbs. Despite this, it is portable due to its air-filled tires. The seats are both independently reclinable and flat and have versatile leg-rests. The canopies are large and swivel a goodly amount for appropriate shade from the sun. Each of these has a peekaboo mesh cut out and can unzip for fresh air. The handlebar is adjustable and easy to use for anyone. The storage is a spacious wide basket. The air-filled tires need to be re-inflated occasionally, but fortunately, the stroller now comes with a pump for emergencies. Their name owes itself to the way these strollers fold up and resemble golf umbrellas. Unlike traditional strollers, umbrella strollers are lightweight enough that people often carry them around in cities, or during airline travels. They’re also lighter on your purse but have independent handles, so you’ll have to use both hands at all times. UPPAbaby, an American establishment with over 10 years into the business of making strollers uses inspiration from its own families. They seek to make their strollers light, safe, and simple to use while maintaining aesthetics and style. They usually take up one car seat. The G-Luxe is a good midrange stroller that, while not the best, is a solid stroller. 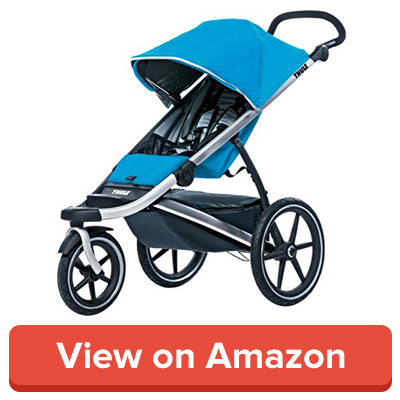 The stroller weighs about 15lbs, making it one of the heaviest umbrella strollers. A similarly priced Quinny Yezz can make a lighter substitute should you wish for that. The G-Luxe has a shoulder strap letting you lug it along with you. Its two-handed fold is convoluted. You need to push a button and pull on both the handles to release and fold the frame. It has a self-stand that locks automatically. The brakes are single action, uncommon in umbrella strollers. They give a sense of ambiguity by feeling set even when they aren’t. Wiggle the stroller a bit to check if the brakes are applied. The G-Luxe has a 10lbs storage bin to easily accommodate a medium sized diaper bag. You can access the bin if the seat is upright, but not when reclined. There’s also a parent cup holder on the side of the frame. This is an innovative model by the inventor of the umbrella stroller. It weighs an incredibly low 7.4lbs without losing any important features. It has ergonomic, anti-microbial handles, ample sunshade, a big basket, a rain cover, a peekaboo fenestella, and a four-wheel suspension, which is a novel feature to umbrella strollers. It has straps for carrying the stroller around. It comes in multiple colors and has accessories like footmuffs, seat liners, and extra sunshades. It is suitable for car usage and close distances like restaurants or walks. 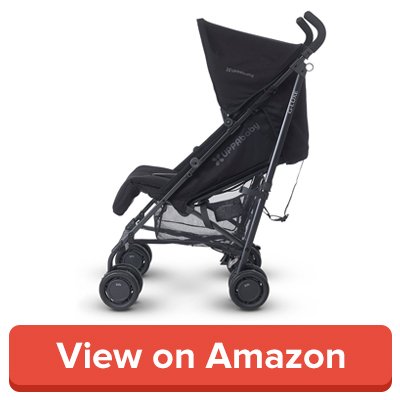 Anything longer or rougher terrain is not ideal for the Maclaren Mark II. The Mark II saves the day when car boot is limited, as it is likely to fit in any way. You can even stow it in the front seat due to its low weight. However, some aspects, like a better suspension, reclining seat and a larger shopping basket make larger strollers worth consideration. You can find many running parents with their infants in strollers all across city parks, pushing around huge strollers. These strollers are jogging strollers. If you have a habit of running, you need not worry about breaking it because of your newborn. 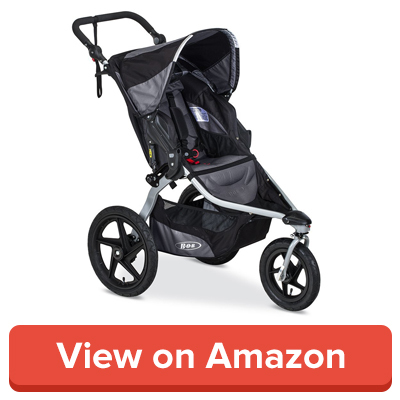 Replacing the fixed wheel strollers, most (like the Revolution Flex) nowadays have locked swiveling wheels and a tracking mechanism to keep the runner moving in a straight line, and almost never needs adjustment. While it is relatively heavy, the Revolution tips back simply and moves with low friction. It has air-filled rubber tires and a changeable suspension letting the runner transition between roads. The handlebar has an 11-inch range aiding parents’ biomechanics. A thick foam drapes it and a wire strap covers the middle section. It has a two-handed folding method that needs you to squeeze levers on both sides of the frame, resulting in a convoluted process. It has the ability to have the straight back in the seat is huge, especially when a child gets older. Otherwise your child would get a sore neck because the seat curved back so much his head would be tipping down towards his chest. The storage basket is bigger than the previous model, but not dramatically noticeable. The Solstice is equipped with front wheels that swivel, with adjustable tracking enhanced by big, easy to use yellow knobs. Pneumatic rubber tires help you keep on track without veering off. With the front wheel locked, tip the stroller back and turn around wide corners. The Burley’s handlebar has a short range of extension, making it a little difficult for those over 6-feet tall. The handlebar’s grips are ergonomic with thick foam, and left-handed people may have a hard time adjusting to the right-handed strap. The under-stroller storage area is huge if we compare this with the BOB. The Burley’s basket is deep, well-organized, and simply a lot bigger. We can carry some extra clothes, diaper bags, toys, books, etc. The Solstice has color-coded points, resulting in a convenient and innovative design. You can fold it in one fluid motion with one hand and leave it, as it self-stands. The brakes are smoother to use than its competitors’ but are problematic if you wear sandals. 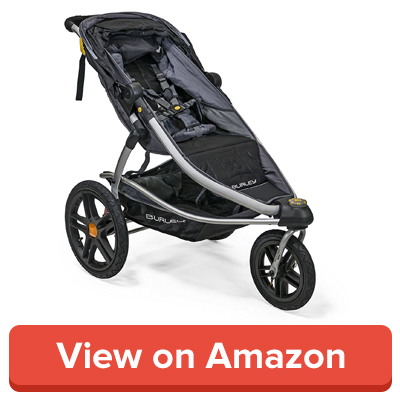 In the jogging stroller section, the BOB Revolution Flex is a strong rival to it, but the Urban Glide comes out on top. In earlier days, serious runners used fixed wheels for strollers, but the contemporary choice is for locking swivel wheels, resulting in versatile jogging sessions. The Urban Glide has locked swivel front wheels that run linear with changeable tracking to keep you on course. An adjustable foam-coated handlebar with improved body biomechanics aids you while running. The bar is so that your hands are allowed to remain neutral, helping with body posturing. A range of 16 inches makes it usable by nearly any parent. It also has a movable safety wrist strap. The stroller has a one-hand folding mechanism, which is a little simpler with both hands. The brakes are single action and are easily accessible with a long wire pedal, which is sandal friendly and easy to push up. The stroller weighs a measly 22.6lbs and a small fold size of 14,500 cubic inches. While full-sized strollers weigh over 20 pounds easily, lightweight versions range from 15-19 pounds and look similar to standard strollers. These have the convenience features of umbrella strollers but are not as bulky. They lack the curved handles customary to umbrella strollers and fold horizontally. Mountain Buggy is notorious for its rough-terrain strollers, but this time, they’ve stepped into the city with the Nano 2016. The stroller weighs only 14lbs but screams quality as you grip it. Framed in satin black, it is a good-looking stroller. The handlebar has a thick foam covering and is at a fixed 98cm height. Its wheels are small but sturdy, and the stroller is 54cm wide. The wheels lock and rotate for cobblestone use, and coupled with the rear wheel suspension, keep your baby’s rides smooth. The pedal brake system is color coded and sandal-friendly. It is equipped with an on-board car seat adapter, which converts nano to a travel system, accommodating any infant car seat with the belt-style adaptors. You can travel easily with your newborn baby in their car seat and in nano. The Cubby Plus is a higher version of the Cubby with adjustable leg-rests, handlebars, and harnesses. It also has an aluminum frame and front wheel suspension. 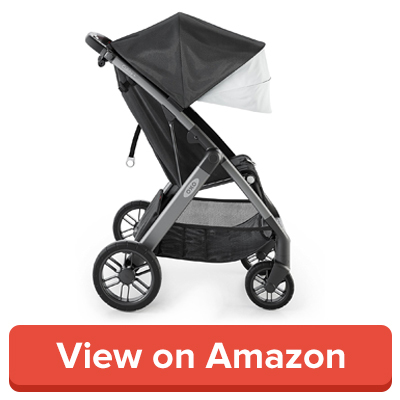 The Cubby Plus weighs 20lbs, has a travel system option, and supports most popular car seats. It has a large waterproof canopy with a pop-out sun visor and a hidden peekaboo window under the last panel, made of a dark Velcro mesh. A deep recline and a big mesh window protect your baby and don’t disturb its sleep. There are three pockets for storing little parent essentials. The handlebar stretches from 39 inches to 42 inches measured from the ground. It has a 5-point harness similar to car seats that straps at the shoulder area. Its brake is between the rear wheels and supports flip-flop usage. Mamas and Papas is a popular brand known for high-end strollers and pushchairs for every lifestyle. Its best use is in the city and has a resilient frame with responsive steering so you can weave through throngs and be sure of its build quality. You can jump on and off public transport with it on long journeys. The seating area is reversible, in contrast to front-facing static seats, letting the child face inwards or outwards. 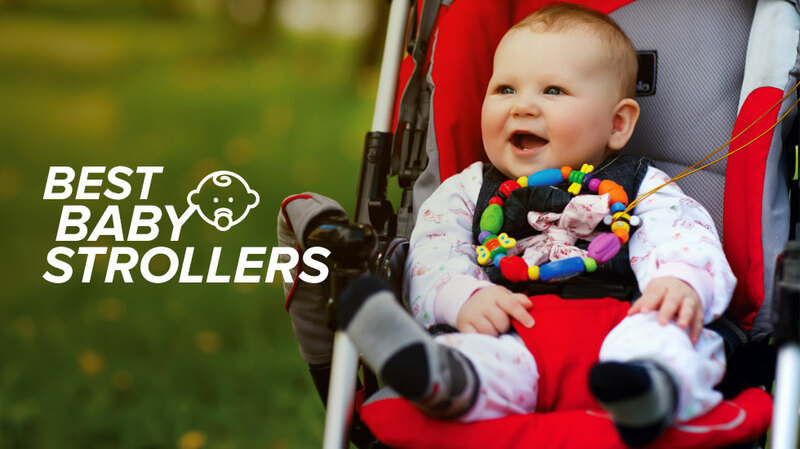 The stroller folds into a small, compact size with wheels clicking, and fits into most cars. The buggy has a recliner option enabling a comfortable sleeping padding for the baby and moves smoothly through crowds. The added suspension makes sure your baby is undisturbed. 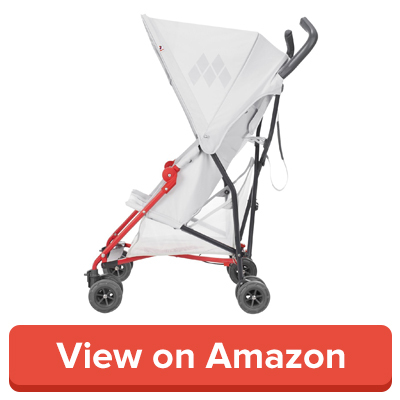 An insect net covers the canopy of the stroller, and a separate rain cover attachment safeguards your baby from many weathers. It also has a cup holder and a magnetic peekaboo window. The stroller comes in various color schemed frames, taking after the present-day fashion.